Millionaire to Billionaire: How Long Does it Take? It only took 2 years for Mark Zuckerberg to go from millions to billions, but he is the exception to the rule. To get to a billion dollars, one has to make a million dollars at least 1000x over. While some people like Mark Zuckerberg have built companies that rapidly ascended the ranks, most people end up following the rule rather than the exception. Credit Suisse says there are 33.7 million people that there were millionaires in 2015, and Forbes estimates that a mere 1,826 of these people are billionaires. That means only 0.0054% of millionaires become billionaires, making it quite a rare feat. 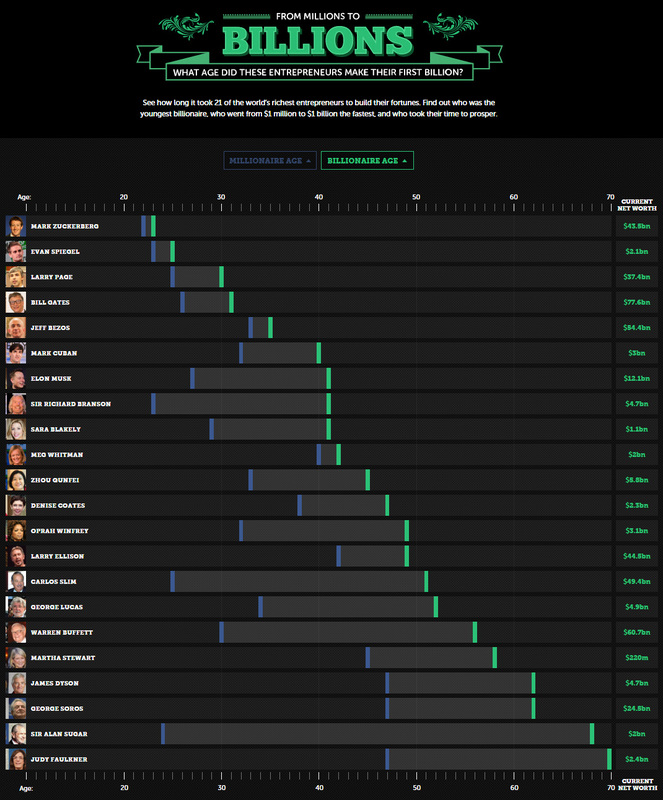 This infographic shows how long it took these 21 famous self-made entrepreneurs to do it.